Does cleaning cookies force me to re-verify my bank log-in? - Ask Leo! It's a pretty quick process to identify all the internet domains that need to be listed in CCleaner as exceptions so that you can easily log in to your favorite sites. Hi, Leo. I believe that every time I run CCleaner, my bank doesn’t recognize me anymore. I then have to go through a whole rigmarole to get on to my account. It’s been suggested that the cause is that I’ve erased the cookie that my bank site has planted and therefore it doesn’t recognize my PC anymore. How can I identify its cookies so that I can isolate it so that CCleaner will not erase it. If you don’t agree, then what do you think is the problem? So, yes, cleaning out cookies, especially if you’re cleaning out all cookies, does exactly what you’ve described. It will force your bank (and you) to go through those extra steps. Many banks with reasonable security have two stages of verification. On a computer that is unrecognized, such as one you’ve not used to visit the bank website before, the process may involve asking you one or more of your security questions before it allows you to complete the log-in. When you next log in, all you typically need to provide is your account identification and your password… until you clean the cookies, that is. Then the site once again no longer recognizes your machine, and makes you jump through those hoops once again. 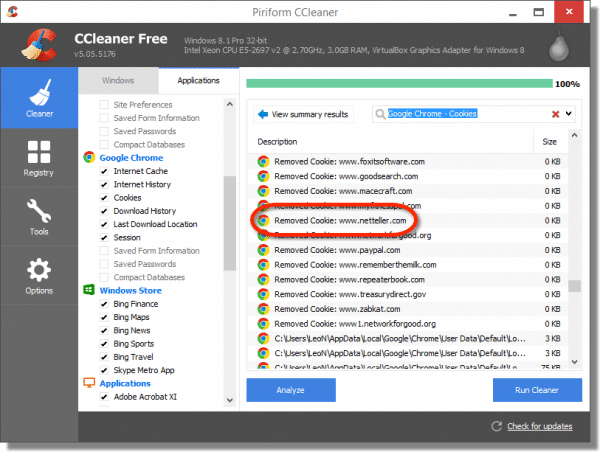 CCleaner, and most cookie-cleaning utilities, give you the opportunity to identify the cookies and to specify exceptions. Run CCleaner and have it run an analyze pass. Then, scroll through the list of all of the cookies that it has found on your machine (it will be long). Look for the cookies that include the domain name of your bank. For example, if your bank is BankofAmerica.com, then maybe what you will find in that list are cookies dropped by BankofAmerica.com. Those are the cookies you want to preserve. One problem is that many banks actually use a third party service. I might go to my bank’s website via their domain, but when I actually log in and access my accounts, they will have switched to the domain owned by this third party. In my case, for example, it’s netteller.com. You’ll need to keep an eye out for that. The next time you access your online banking information, take a look at the different domains that appear in the address bar. It may just be your bank; it may be several domains that are owned by your bank; it may be domains that the bank uses from a third party, as I described. All of those domains need to be listed in CCleaner as exceptions, so the program doesn’t clean the cookies associated with those domains. It may end up being a bit of trial and error. In other words, you may think you’ve identified a few of the domains associated with your banking and done the exception thing, only to find that you didn’t catch all the domains. But my guess is it will be a pretty quick process to identify the internet domains that need to be listed in CCleaner as exceptions so you can continue to log in without having to jump through all these extra hoops. How do I view cookies in IE 11? - View cookies in IE using the normal easy-to-remember way, or the quick way. How Do I Delete Cookies? And Just What Are Cookies, Anyway? - Deleting cookies is an easy task. Whether it's absolutely necessary or not is another matter. Firefox itself could be also erasing the cookies each time the browser is closed. Go to Tools-Options-Privacy tab to check the cookies and history settings. In MY particular case, I hasten to add, the existence of cookies does not have any effect upon my online banking whatsoever. In every case my anti-virus programs remove all cookies and this has no effect whatsoever on my usage of my two banks (the largest bank in the world and another international which comes close) both of which are accessed from my browser’s Bookmarks. When I reformatted my computer, the first thing I did on the internet was to go to every website that I have an account and log in. I didn’t do anything else on the internet. I then went to CCleaner and moved every cookie in the list over to the list of cookies to keep, with the exception of obvious advertising cookies that came in from an ad on the log in page. Now CCleaner knows exactly which cookies are required to preserve my login information (at least until somebody changes something). I don’t let Firefox delete cookies; I don’t let my anti-virus/anti-malware program delete cookies. In fact CCleaner is the only program I allow to delete cookies. Probably the easiest and best solution is to stop using CCleaner – or. at least, to stop using it to clear cookies. There’s absolutely no reason to delete cookies and doing so is simply an unnecessary hassle. In fact, there’s really no reason to use CCleaner – or a similar app – at all. The things that these apps delete are things that are designed to make your computer and web browsing faster and better. CCleaner will not speed your computer up; it’ll slow it down. Additionally, there apps can and do cause problems – Google “CCleaner problems” (or something similar) and you’ll see what I mean. The best advice is to not clean-up apps at all. They service no useful function, negatively impact performance and have the potential to cause problems. Stick with the built-in Disk Cleanup utility: it’s safer. The hundredes of GB that CCleaner saves me from having to backup makes the use of CCleaner worthwhile to me. I don’t, on the other hand, use registry cleaners. There’s little value in registry cleaners. I also hate advertisers tracking me through all the websites I visit, so I do like to periodically clean my cookies. But cleaning cookies every day is overkill. CCleaner allows you to run a scan in Analyze mode and then you can verify everything that will be deleted/cleaned and correct if necessary before actually cleaning. That way you know that you are deleting only what you want deleted. It’s more sophisticated than those “just trust me to clean it properly” tools. You have the option of knowing what it’s about to do. You can also delete each one C Cleaner picks up manually. IE is usually the largest and slowest for C Cleaner to pick up the files. What I have found is it IS a good idea to clean cookies since when I visit sites like Amazon and look at a few items, those specific items can appear in Google and sometimes even at other sites not related to Amazon. Running C Cleaner will stop that until the next time I look for another item on Amazon or several other sites. CCleaner has the option to NOT clean cookies when running it. Go to the menu on the left and uncheck the “cookies” box, and your cookies will not be deleted. You can leave it that way as a default, too. i want all junk, cookies included, periodically cleaned out. i have the same issue with my bank, but using Keepass, and the fact that the bank sends confirmation code by email, makes it relatively painless to log back into the bank. I want the added security. BUT, I LOVE JAMES’ reply; he logs onto all significant sites, gets cookied, tells ccleaner to NOT delete them ! That is GENIUS !! In fact, i may do that to my system, clean out all cookies, then log onto the significant sites, save the cookies now (tell ccleaner to not delete). My CCleaner deletes cookies all the time. I don’t have any problems with my secure sign in sites. Though I did accidently delete my passwords a few times, before I remembered to uncheck it. I use a Firefox add-on called CookieKeeper that forces Firefox to not delete cookies I want to keep. It can easily be overridden by changing the clearing all cookies setting in Firefox or by other means, I’m sure, such as CCleaner. Still it preserves your cookies when you need them. I wish I was more sophisticated about cookies but CookieKeeper works for me. Ever since I installed the new app Cookie Monster I have not seen one cookie on my system, not sure where they went…. After deleting all cookies with CCleaner, log on to the bank website without going to any other sites. Then, look at the cookies on your machine. These are the ones that you need to keep. but it says my BROWSER does not allow cookies so I cannot pay bills!!?? It’s probably a setting in your browser which you can change to allow cookies. What browser do you use?